• Consistency And Quality. Work performed tends to be consistent as it is driven under same management and company policies. Collaboration between the two operations is easily managed. Any tweaking or fine tuning that may be needed with the mold is more easily and quickly accommodated than if the mold had been made by a separate shop. Incremental test runs can easily be performed to verify progress at different stages of a complex operation. • Accountability. Both operations being performed in house eliminates the finger pointing and blame that can take place between separate shops. • Less Hassle For Customer. Customer does not need to get involved in dealing with separate shops for the different operations. • Less Expense. Having both operations performed in house usually means greater cost savings. • Time Savings. 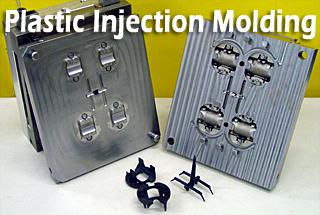 Jobs where both mold making and final plastic injection molding take place in same shop can be done in much less time than if performed by separate shops. Our team is ready to take on your next project today.